Does your family have a history of selfless service? Are there members of your family that live for the hunt? The camouflage pattern is timeless and we are now proud to introduce you to our complete line of Camo Toddler Bedding sets. 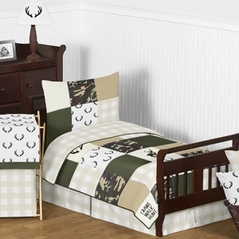 These camo toddler bedding sets are sure to make the most of your childs room space. Give your little toddler the "protection" they need with our camo toddler set. Children�s Camouflage bedding is perfect for any little soldier or soldierette's nursery looking for a military inspired stylish theme. 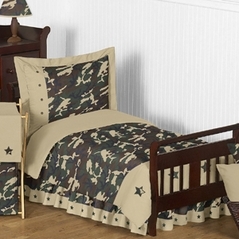 Our kid�s camo bedding is available for cribs, twin, toddler and full/queen size bedding sets for both boys and girls. We also have matching camo room decor accessories to give you the complete camouflage feel, including rugs and wall coverings. And here at Beyond Bedding we only carry the finest quality bedding sets from reputable manufacturers such as Sweet Jojo Designs. And make sure to pick up a coordinating bed skirt, matching camo toddler bedding hamper, or other accessories to complete your rooms theme.